When the nominees for the Directors Guild Of America’s annual awards were announced, we felt compelled to point out that the vast majority of them—all on the film side and most on the TV side—were men. 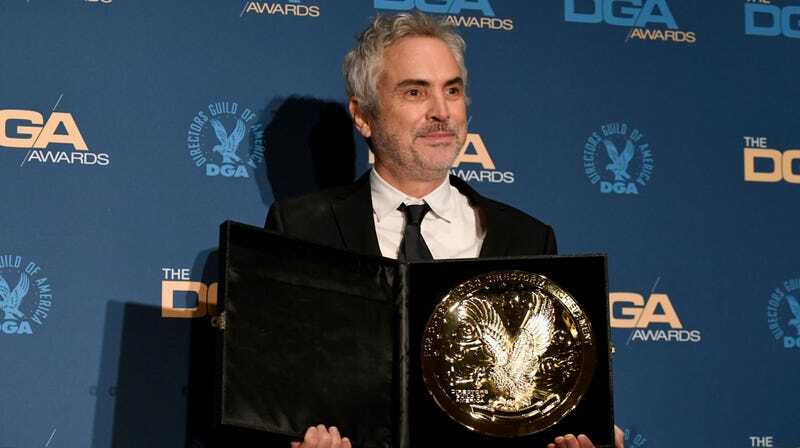 Now that the winners of the DGA Awards have been announced, we feel like it’s similarly worth noting that all of the winners are men. The film winner, the TV winners, the TV special winner, the documentary winner, the variety series winner, and even the commercial winner were all men. Of course, it wasn’t until last week that a bunch of Hollywood producers announced a plan to actively try and hire more female directors, and the movie industry wouldn’t have realized it needed something like that without going through a year like 2018 where only eight percent of the highest-grossing movies were directed by women. Anyway, as for who these man-winners are: Alfonso Cuarón won for best feature film for Roma (continuing the rough awards season for A Star Is Born), Bo Burnham won the award for first-time feature film with Eighth Grade (another one that A Star Is Born was up for), Adam McKay won the TV drama award for his work on HBO’s Succession, Bill Hader beat out Amy Sherman-Palladino and Daniel Palladino to win the TV directing award for Barry, and Ben Stiller won the TV movie/limited series award for Escape At Dannemora. Most of the nominees and winners are below, and the full list is over at The Hollywood Reporter.